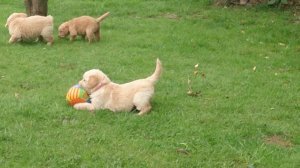 4 Beautiful chunky Registered Golden Retriever puppies for sale . All puppies are very bold , playful , outgoing and socialized with children . Both parents have got fantastic temperaments and have been hip, eye and elbow tested and have excellent results. Mother is a light golden color whereas the father is dark golden and both dogs can been seen while viewing the puppies as they are both owned by us. The puppies will be registered and have been wormed regularly and flea treated until they leave. They have already had their first vaccination and have also be thoroughly vet checked.